MyoRIP ELITE is our latest extreme potency fat burner! Designed to hit fat with multiple mechanisms while delivering the clean energy and buzz that made MyoRIP V2 so popular! 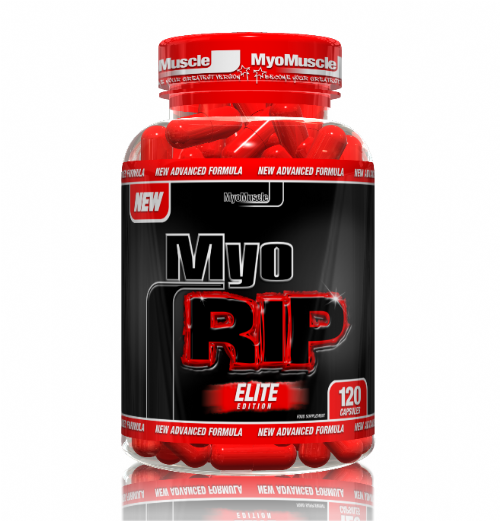 MyoRIP ELITE - a fat burner without comparison! 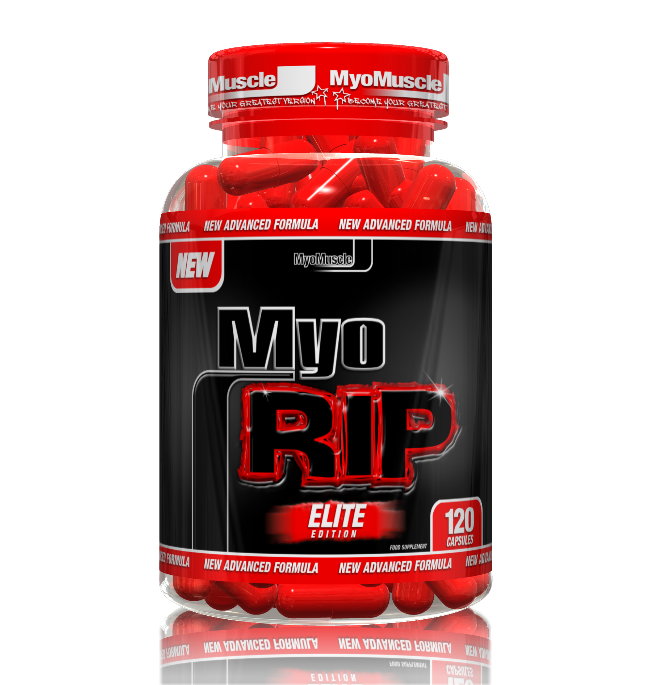 MyoRIP ELITE is our brand new extreme potency fat burner! MyoRIP ELITE combines the latest research proven ingredients shown to not only destroy stubborn body fat but also enhance energy, focus and mood at the same time! The innovative ingredients found in MyoRIP ELITE make it the most effective fat burner we've ever created! With a HUGE 120 capsule tub MyoRIP ELITE still offers the unbeatable value our fans have grown to love! What Makes MyoRIP ELITE Our Most Potent & Effective Fat Burner Yet? Methyltheobromine is one of the most researched and proven ingredients on the market for weight loss. Methyltheobromine has been scientifically proven to enhance ‘lipolysis’ (the breakdown of fat) literally speeding up the rate your body is able to reduce body fat by converting body fat into energy. Furthermore, methyltheobromine is known to release energy in your body. A little extra energy never goes a miss when you're dieting! Mucuna pruriens is one of the more potent mood enhancing super-foods available containing high levels of a compound called 'L-Dopa' or 'Levodopa'. L-Dopa is a natural precursor to the neurotransmitter 'dopamine' which acts upon the central nervous system (CNS) and plays a vital role in motivation, attention span, mood, sexual desire and many other functions! Unfortunately, the regular use of stimulants can lower natural dopamine production. MyoRIP ELITE contains mucuana pruriens to help maintain optimal levels of dopamine which is associated with a positive effect on mood and motivation making restricted calories that little bit more bearable! Too many times the mind gives in before the body. Not any longer! Have you ever used a potent fat burner which has left you feeling anxious and edgy all day? It's not pleasant! L-Theanine is an amino acid which can naturally be found in green tea. So why is L-Theanine in MyoRIP ELITE? L-Theanine is known for its ability to relax without causing tiredness. Due to this unique property L-Theanine is included in the advanced MyoRIP ELITE formula to allow a higher level of potency without increasing the unpleasant edgy feeling associated with some alternatives on the market! Fucoxanthin is naturally occurring in some forms of seaweed. Fucoxanthin, via its metabolites, is stored in fat cells for a prolonged period of time. As a result fucoxanthin has been scientifically shown to induce fat loss while inhibiting fat cell development! Although at this early stage scientific research is limited with this innovative ingredient, fucoxanthin does appear to be a promising non-stimulatory fat loss agent! Now you can hit fat from multiple angles for the best results possible! Chromium picolinate is widely promoted to help users lose weight, increase metabolic rate (metabolism) and reduce cravings. Studies have shown that chromium contributes to normal macro-nutrient metabolism and blood glucose levels. This may explain why some users report a significantly reduced craving for carbohydrates or more specifically sugar when supplementing with chromium! Only MyoRIP ELITE combines these proven ingredients to quickly reduce body fat, improve mood and energy, reduce physique destroying cravings and help you achieve the body you want and deserve. Get MyoRIP'd Today! Other Ingredients: Gelatine (Capsule), Magnesium Stearate, Dicalcium Phosphate. Suggested Use For optimal results take 1 serving (1 capsule) upon waking followed by a second serving (1 capsule) approximately 6 hours later. Please note that the second serving is optional. Some users may find that 1 serving per day is completely adequate. "Absolutely amazing product, got rid of my bloat overnight and made me physique look a lot harder as well as improving my energy, couldn’t recommend enough definitely worth a buy"